The last family to depart from Babenhausen Kaserne left in January 2007. The installation maintained housing there since 1951, and the Lipari family was the last to live there.We were the very last family left on Babenhausen Kaserne. We moved there in December 2004 and stayed until January 2007. I loved when they had cookouts at the chapel or family activities on post that we could walk to and enjoy. There were always bouncy castles, lots of food and plenty of neighborhood kids to play with. We enjoyed several festivals in downtown Babenhausen, including the Spargel Fest and the Kinder Fest. Our most favorite restaurants included Pizzeria Maria’s in downtown Babenhausen and Trojka on the way to Aschaffenburg. Whenever we went to downtown Babenhausen, we felt like part of the community, never like outsiders or foreigners. Everyone did a great job trying to learn English as we were trying to learn German. They tried to make us feel at home. There are many things we miss about Germany, including the wonderful bakeries, the relaxing atmosphere in restaurants, the friendliness toward children and dogs, and the Germans’ love for the outdoors. It is sad to know there will be no more American family memories made in Babenhausen, but we know it will be a great addition to the town itself. We had a great friendship with the Ponds guards (some who even gave gifts to our children when they were born or had birthdays, and we, in return, brought them home-cooked food to the gate when we had parties) and they truly felt like family. Babenhausen was a great family place, and we will never forget the memories made there. 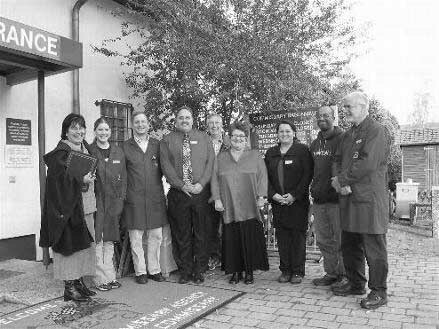 We made many German and local friends within Babenhausen and Aschaffenburg and we greatly miss them. We are so thankful we had our chance to live in Germany. It is an opportunity we will never forget and will always cherish. BABENHAUSEN, Germany — The Headquarters and Headquarters Battery, 41st Field Artillery Brigade inactivated Thursday as part of a larger Army move to restructure artillery units while increasing the number of frontline combat units. Col. Richard G. Cardillo, the V Corps Artillery commander, told soldiers from the “Railgunners” that their inactivation is helping a nation at war. The Railgunners’ mission was to deliver conventional rocket and missile fires and provide counterfire operations. 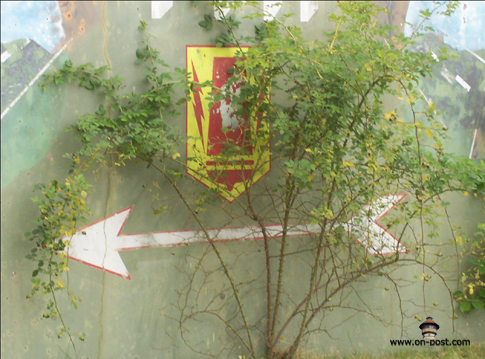 The brigade was the parent unit of the 1st Regiment, 27th Field Artillery Battalion, which is not deactivating. Most recently, the 41st conducted stability and support operations in Iraq, where they spearheaded the movement and destruction of 55 million pounds of enemy munitions. The brigade also trained 18 Iraqi Civil Defense Corps platoons. 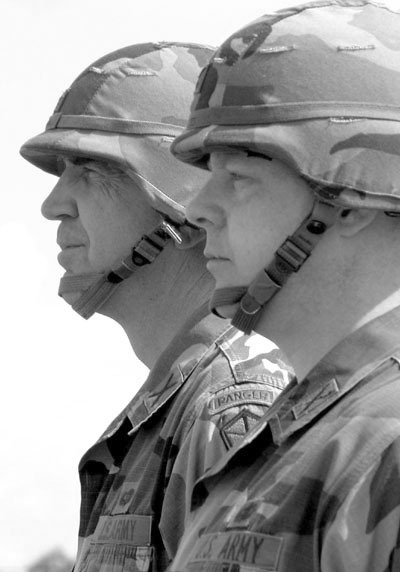 In its history, the unit has deployed to Vietnam, Albania and Kosovo. About 100 soldiers were affected by the inactivation. Many moved to different units within the Babenhausen casern, while others were moved to other V Corps or stateside units, or left the Army. One soldier who simply moved down the hall of the old building he used to work in said the inactivation ceremony made a perfect ending to his first duty assignment. Spc. Nicolas Pienkiewicz, who was holding the unit guidon during the ceremony, said he’s made great friends within the unit and worked for an outstanding command team. “It was great ceremony that really meant a lot to me,” said Pienkiewicz, who has been in the Army for two years. The tearful Col. Gary D. Langford, commander, highlighted the relationship between the unit and city throughout the post’s 33-year history. He praised the troops he led as superb and said he was delighted he and his family got to know the German community so well. After the ceremony, guests went to the post flagpole near the front entrance to watch Langford honor Babenhausen’s new honorary commander. Lt. Col. Bernd Willand, who is originally from Babenhausen but immigrated with his family to the United States and later became a citizen, received a key to the casern. Willand, a bilateral affairs officer, traveled from his post in Ukraine to attend the ceremony. Command Sgt. Maj. Michael Pinckney begins to furl the 41st Field Artillery Brigade flag, to be cased during the inactivation ceremony on the post soccer field in Babenhausen, Germany, Thursday. Col. Richard G. Cardillo, left, the V Corps Artillery commander, and Col. Gary D. Langford, the 41st Field Artillery Brigade commander, during the inactivation ceremony in Babenhausen. A soldier completes the inactivation ceremony with a salute to V Corps Field Artillery and 41st FA commanders. About 7,200 military positions and 11,000 family members will be affected, with about 4,800 positions being moved to the U.S. or elsewhere, and 2,400 being reassigned within Europe, according to Maj. Gen. Mark Hertling, USAREUR’s deputy chief of staff for operations. 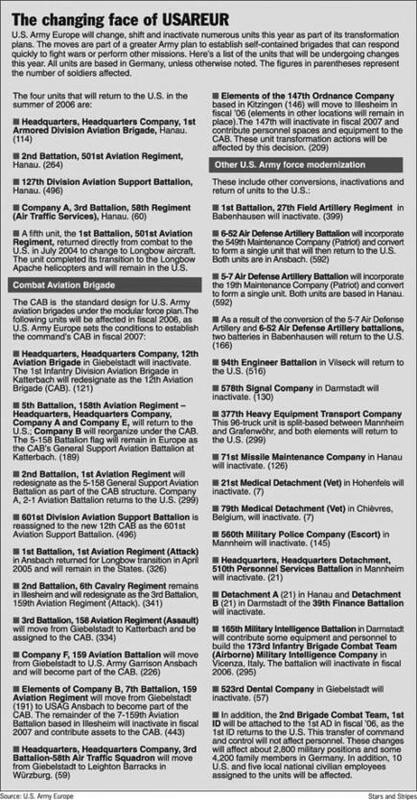 In addition, 40 U.S. and 38 German civilians assigned to the units will be either moved or lose their jobs. The moves are part of the Army’s plan to establish four combat brigades in Europe: the 2nd Cavalry Regiment (Stryker) in Grafenwöhr, Germany; a Combat Aviation Brigade in Ansbach, Germany; 173rd Aviation Brigade in Vicenza, Italy; and a rotating brigade, the Eastern European Task Force, operating in Romania and, possibly, Bulgaria. Other support brigades of various sizes will be stationed in the Kaiserslautern and Wiesbaden areas and elsewhere. While in places such as Grafenwöhr the U.S. military population will be increasing, a significant reduction will be made in Hanau and Babenhausen, Germany, and elsewhere. “Unfortunately, guys like me had to go to their counterparts, the mayors and local politicians, and say, ‘I’ve got bad news for you,’” Hertling said. “Here’s what is happening, here’s our plan, so prepare your workforce. Units affected also include ones from Ansbach, Vilseck, Darmstadt, Mannheim, Grafenwöhr, and Hohenfels in Germany, and Chièvres, Belgium. The affected units vary in size from small veterinary detachments to entire battalions. 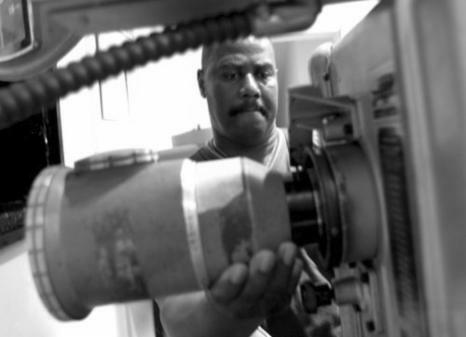 For the inactivated units, the coming months will see soldiers counting and fixing equipment, large and small. The Army would then allocate the equipment as it sees fit, with some being sent to the U.S., some sent to units in Europe who need the equipment, and some possibly being sent to forward locations. For the soldiers of inactivated units, they will be assigned by Army personnel officials to other units who mix and match job specialties with unit needs. Thursday’s announcement did not mean that the affected installations would be closing in the coming year, said Kim Walz, spokeswoman for the Installation Management Agency-Europe. Any decisions to close installations would come only after the units and their soldiers settle into their final locations, she said. The moves are part of a greater Army plan to establish self-contained brigades throughout the world that are able to respond quickly and en masse to fight wars or perform other operations. USAREUR currently has about 62,000 soldiers stationed throughout Europe, and plans to reduce that number to about 24,000 in the next five years. The Wiesbaden-based 1st Armored Division is expected to be moved back to the U.S. around 2009 or 2010, Hertling said. But that time line could be affected by deployments and other world events. Other supporting units of various sizes will concurrently be inactivated, changed or moved, the general said. The moves follow an announcement in July that much of the Würzburg-based 1st Infantry Division’s personnel and assets would be departing Germany for the U.S. by the end of September. In other recent U.S. military transformation moves, the U.S. Navy relocated its headquarters from London to Naples, Italy, and the Air Force closed its base at Rhein-Main, near Frankfurt, while increasing its capabilities at the Ramstein and Spangdahlem air bases in western Germany. Thursday’s announcement dovetails with the stated strategy of the U.S. European Command, the Stuttgart-based joint command that oversees U.S. military activity in Europe, including Russia, as well as Israel and most of Africa. EUCOM believes its “arc of instability,” where nations and people are most likely to face war, famine and other turmoil, has moved east and south of Europe. The U.S. military has responded by increasing training and communication with militaries of the former Soviet bloc and with African nations. In December, the U.S. announced it had reached agreement with Romania to establish joint military installations there. A similar agreement with Bulgaria is expected in the next few months. The U.S. in recent years has also been training with militaries of northern African nations such as Niger, Mali, Mauritania, Chad and others. U.S. troops have been stationed in Germany since the end of World War II, and more than 10 million troops served there from 1950-2000, according to the Heritage Foundation. Through the 1980s, some 250,000 troops were stationed continuously in the former West Germany. Many were positioned during the Cold War along the border with Communist-ruled East Germany and the Soviet bloc. West and East Germany unified in October 1990. After the Soviet Union collapsed in 1991, it split into smaller nations. Many of those nations as well as former Soviet allies Poland, Romania, Hungary and others became independent or allied with the U.S. and western Europe, and the Cold War threat was greatly diminished. 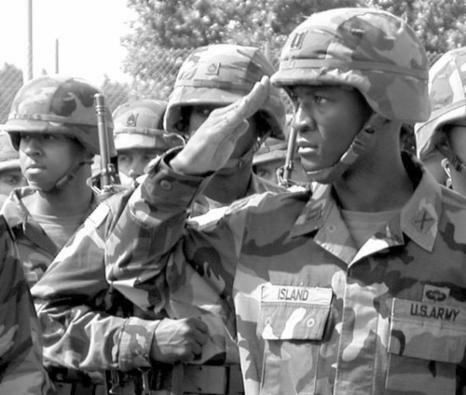 A massive reduction of U.S. troops and base closures ensued. By 1993, only about 105,000 U.S. troops were stationed in Germany, and by 2000 the number had fallen to about 70,000. 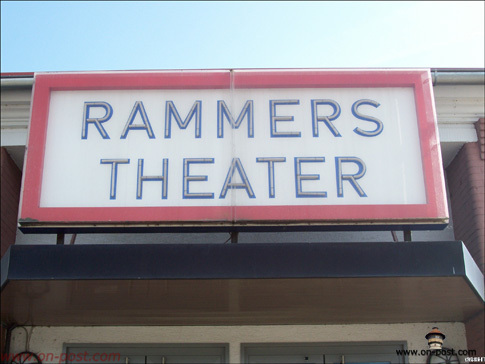 BABENHAUSEN, Germany — The marquee at Rammers Theater won’t light up after today. Considering that the field artillery unit the movie theater is ostensibly named after inactivated, this seems to make sense. But there are still hundreds of soldiers and family members left at this small post, and they are not happy to see the few remaining amenities close shop while troops are still living here. “It makes us feel like we kind of don’t exist anymore,” said Jenny Weiss, 22, a military spouse from Paoli, Ind. Hours before the final credits roll today, the post’s Burger King will have slung its last burger. On Monday, the dining facility closes. Two weeks ago the dental and medical clinics shuttered their doors. “It’s almost like going to a ghost town sometimes,” said Nola Maloney, who oversees the post’s operations. The closure of the Burger King, which was planned after the dining facility was already on the chopping block, drew protests from Maloney and Army leaders, who asked the Army and Air Force Exchange Service to keep the burger joint open until all the troops were gone. “AAFES’ comeback to me was, ‘No, things are too far in the works,’ ” Maloney said. The Burger King has lost more than $10,000 a month, said Thomas P. Gross, general manager for the Wiesbaden and Hanau consolidated exchange, which oversees the store. Hardly anybody was coming in to eat, he said. He noted that the dining facility was closing as well and thought it was unreasonable to expect Burger King to fill its shoes. “It’s the military’s responsibility to feed the soldiers,” Gross said. This answer won’t feed soldiers like Sgt. William Graham, 24, from Bogalusa, La. He’s a member of the 77th Maintenance Company — Babenhausen’s remaining unit, which deactivates Aug. 4 — and like most of the soldiers in his company, he hasn’t received orders for his next assignment and doesn’t know when he’ll be leaving. About 200 to 250 soldiers are left on the base. Graham used to eat at Burger King once or twice a week, usually for breakfast. Anthony’s Pizza, which is open only weekdays for lunch, will be the only place left for troops to get prepared meals, he said. “Soldiers who don’t have vehicles are at the biggest disadvantage,” Graham said. He routinely drives half an hour to Darmstadt or Hanau for groceries or to visit a post exchange, and his soldiers frequently bum rides off him, he said. In addition, the post’s small commissary has drastically reduced its inventory, Graham said, adding that many people have relied heavily on the store. By the time the dining facility closes, all troops here should be getting an allowance for food, meaning they are supposed to buy their own food, Maloney said. The only dinner option for troops without cars will be the commissary or the AAFES shoppette. “There’s nowhere for these soldiers to get breakfast or any decent lunch,” Maloney said. Besides the commissary, the shoppette is the only other place on post to pick up a midday snack. “I go to the shoppette every day, and now it’s closed two days a week — very inconvenient,” Graham said. The shoppette is now closed Tuesdays and Wednesdays and opens at 11 a.m. the rest of the week. It closes at 7 p.m. weekdays and 5 p.m. on weekends. Despite the obvious drawdown, “We haven’t received any official word on the closure of Babenhausen,” Maloney said. Jayme Loppnow, a spokesman for the base, confirmed that officials have not said the base will close and added that unit inactivations have nothing to do with base closures. In the meantime, the commissary and bank plan to stay open until the last soldiers are gone from the post, as will the post office and shoppette. But the list of what is staying pales in comparison to the list of what has closed or will close soon. The thrift shop and adult education center closed June 1, and the post gym, library and auto skills center will close Sept. 29, Maloney said. Trade Winds — the post’s all-ranks club and the one diversion left after the movie theater closes — will close at the end of September. To cheer up the shrinking community, John Rhynes, one of the movie theater managers, squeezed in a showing of “Pirates of the Caribbean: Dead Man’s Chest” on Tuesday, even though the theater wasn’t scheduled to show a film that day. He has worked at the theater for more than six years and knows it’s one of the few things left to entertain troops here. John Rhynes, a movie theater manager who has worked at Rammers Theater for more than six years, changes the lens on a projector Tuesday. The movie, "Pirates of the Caribbean: Dead Man's Chest," wasn't supposed to be shown at Babenhausen, but Rhynes showed the film as a treat for the community, which will see the theater close Friday. Mike Janney and his daughter Kirstyn buy goodies at Rammers Theater, which, along with other businesses at the Babenhausen post, is closing. 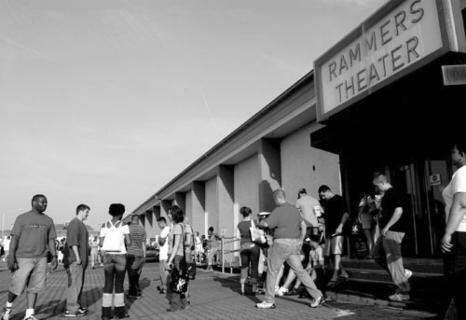 Moviegoers wait outside Rammers Theater after a fire alarm caused hundres of patrons to hoof it into the parking lot. "We're big movie people," said John Weiss, 27, who was at the theater with his wife. The couple goes to the movies once or twice a week. After the theater closes Friday, they will have to drive about a half hour to see English-language films. The Department of Defense announced Wednesday that four U.S. Army facilities in Babenhausen and Aschaffenburg, Germany, will be returned to the host nation sometime in fiscal 2007. The facilities are the Aschaffenburg Family Housing Area, Aschaffenburg Training Area, Babenhausen Kaserne and Babenhausen Family Housing Area. The facilities, part of U.S. Army Garrison Darmstadt, were identified as excess, based on the announced inactivation of all units assigned to the area, according to a Pentagon news release. A statement from U.S. Army Europe said the return of the facilities is in keeping with plans to transfer American forces from Europe to the U.S. and with other plans to rearrange the remaining military assets on the continent. Nearly 1,000 soldiers were previously stationed at the facilities. There are now some 200 soldiers — all but about 20 of whom are in the process of leaving — plus 44 U.S. civilian and 20 German civilian employees assigned to the installations, according to the U.S. Army Europe Public Affairs Office. The remaining soldiers should be gone by late October. Closure of the facilities is expected to save more than $9 million annually, according to the Pentagon. 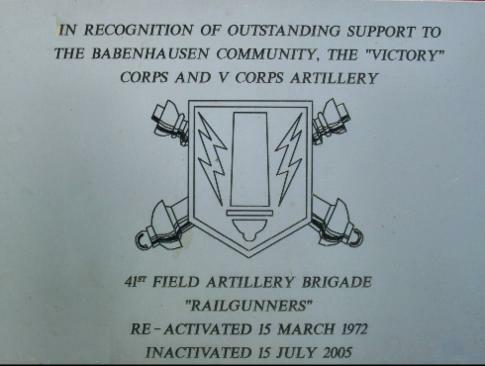 Until recently, Babenhausen had been home to the 1st Battalion, 27th Field Artillery Regiment; two batteries of the 5th Battalion, 7th Air Defense Artillery Battalion; and the 71st Ordnance Battalion, all of which inactivated earlier in the year. 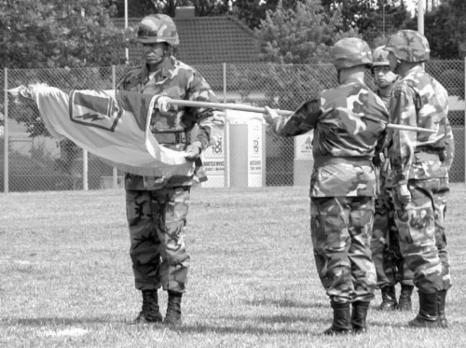 Babenhausen’s last active unit, the 77th Maintenance Company, held an inactivation ceremony Aug. 4, but is not expected to inactivate officially until early fiscal 2007. With the departure of the 77th, no tactical units will remain. Reinhard Rupprecht, Babenhausen’s mayor, said he expects the Army will hand the facilities over to the German federal government sometime in 2008. He said his town is not interested in buying any of the facilities. Even without soldiers, the post will continue to have gate guards for the near future, Rupprecht said. Lack of attendance wasn’t the only reason church services at Babenhausen ended. 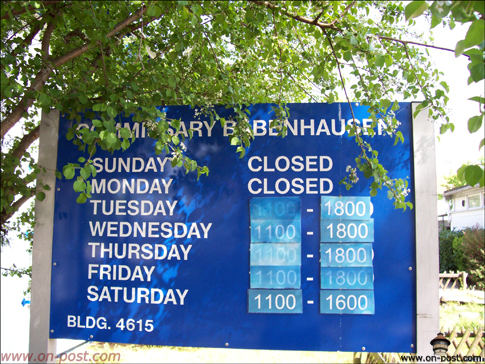 The Pentagon announced Aug. 23 that it will turn Babenhausen over to the German government in fiscal 2007, and soldiers have been leaving the post in droves. While the handful of parishioners left at Babenhausen now have to go to nearby Darmstadt or Hanau for church services, the post’s shutdown is good news for other chapels in the area, which have staked claims on the equipment, religious objects and other items in the defunct chapel. “We’ve already taken 25 of their chairs with kneelers out to Landstuhl chapel,” said Staff Sgt. Jonathan Vinson, the chaplain noncommissioned officer in charge for U.S. Army Garrison Kaiserslautern. Months before the announced closure, Babenhausen’s chapel posted a list, accompanied by pictures, of all the things up for grabs. “It was almost like a catalog online,” Vinson said. Besides the chairs, Vinson also laid claim to Babenhausen’s organ, sound system and smaller items that will support three chapels in the Kaiserslautern area. “It really enhances the worship services,” said Vinson, who has had to borrow equipment and religious items from other chapels on occasion. All of the property at Babenhausen’s chapel has been spoken for, said Chaplain (Lt. Col.) Jack Herron, U.S. Army Garrison Darmstadt’s head chaplain, who used to provide Catholic services to Babenhausen. Despite all the re-acquisitions, chapels in Germany aren’t strapped for cash, say officials at the U.S. Army Garrison Heidelberg, which oversees Babenhausen. Requests for equipment do get turned down, but “I’ve never seen anything that was turned down because of the money,” said Chaplain (Lt. Col.) Michael Strom, who works in the U.S. Army Garrison Heidelberg chaplain office. That also doesn’t mean all chapels have everything they want. Strom said requests made by smaller chapels, such as the one at Landstuhl Regional Medical Center, may be turned down if officials determine the cost of a request outweighs its benefit. But the closure of Babenhausen makes it possible for some chapels, especially the smaller ones, to sidestep the normal acquisition process and “allows us to get those ecclesiastical items quicker,” Vinson said. Other valuables from Babenhausen, including a piano, will move to chapels across Germany. Nobody Stars and Stripes spoke with knew the monetary value of all the items being handed down. Of the roughly 200 soldiers still at Babenhausen, all but about 20 are in the process of leaving, according to a U.S. Army Europe spokeswoman, Lt. Col. Elizabeth Hibner. Meanwhile, an application has been filed to decommission the Babenhausen chapel before the post is handed back to Germany, Herron said. The Wiesbaden Zone lost yet another store as 2006 came to a close. The Babenhausen, Germany, Commissary, a Darmstadt annex, threw a party and bid an official farewell to its few remaining customers on Oct. 31. The closure came when the installation was declared excess by the U.S. Army as part of the overall transformation in Europe. Its sister store in nearby Aschaffenburg closed in August 2005. The Darmstadt store remains open to serve the area. Babenhausen Commissary, situated behind a quaint wooden fence and framed by cascading birch trees, sat on a vintage 1900s installation boasting an interesting international history. From 1918-1920, the installation was occupied by the French. Following the German invasion of Poland in World War II, it became a military hospital. In 1945-46, the U.S. Army used it as a prisoner of war and repatriation camp for German soldiers, and later it was used as a United Nations refugee camp for Slavic freedom fighters and refugees. In its last hurrah, the installation was home to the 1st Battalion, 27th Field Artillery Regiment; two batteries of the 5th Battalion, 7th Air Defense Artillery Battalion; and the 71st Ordnance Battalion. Constructed in 1952, the building was not a commissary until 1986. In 1987, Melvin Fox, now DeCA Europe deputy director, was a commissary management specialist there under the U.S. Army Troop Support Agency. In 1991, the building that housed the commissary at the end was chosen as its new home. The first and last store manager at Babenhausen was Maria Ferguson, a local national who joined the commissary service under the Troop Support Agency. The store had two registers and three employees. Its sales in fiscal 2005 sales totaled over $852,000. For 2006, sales dropped to $520,700 as troop presence declined. The Babenhausen Commissary staff gathered the last day of business along with Nola Maloney, base operations manager, for U.S. Army Garrison Darmstadt-Babenhausen Kaserne. Maloney presented the store with a scroll of appreciation and Ferguson with a 25-year certificate. On hand for the occasion are: (l-r) Sally Hallauer, Darmstadt Commissary administrative assistant; Sarah Fuller, Babenhausen store worker; Scott Huckins, Darmstadt grocery manager; Donald Bailey, Darmstadt store director; John Heinemann, Babenhausen bagger; Maria Ferguson, Babenhausen store manager; Edyta Verdejo, Darmstadt store worker leader; Michael Borden, Darmstadt motor vehicle operator, and Lynwood Peeples, Darmstadt store worker.